Translation: Melted cheese with roasted peppers and chorizo. Verdict: Yum. If any of you have watched Top Chef or Top Chef: Masters you know who Rick Bayless is. He's been a favorite celebrity chef of Johnny's and mine because he's local so his restaurants and Frontera products are accessible and he's mastered one of our favorite cuisines: Mexican. The attention to detail and love that Rick pours into learning Mexican food is really impressive, as is his sharing of the craft. Rick and his wife lived in Mexico and studied every little in and out of local cuisine. He's also really respectful and responsible in his ingredient usage. He was a founding member of Chefs Collaborative for environmentally friendly practices, and he uses only sustainable seafood. Him and his staff started the Frontera Farmer's Association, his charity of choice on Top Chef: Masters, which provides grants to local family farms. As you can tell, I really like and respect Rick, so imagine my delight when I tweeted him for chorizo suggestions from our cookbook and he tweeted me back with two recipes and their page numbers! I love that I got a personal recommendation from the cookbook author and chef himself! He's such a cool guy, he tweets often and makes himself accessible to his fans, answering questions left and right. This recipe made enough to fill 6 tortillas and was a little deceiving in the fact that so little can be so filling! Johnny had three, I had two, and it was plenty! Roast the poblano over the open flame of a gas burner until the skin is blistered and black. If you do not have a gas stove you can cook these under the broiler of your oven. Carefully rinse the skin off under water and remove the seeds and membrane. Slice into strips. Turn the oven to 375° and set a pie pan or ramekin inside to heat while the oven comes up to temperature. In a medium skillet heat half the oil over medium heat. Add the sliced onion and cook about 8 minutes until the onion is slightly browned. Add the pepper strips and cook until they're softened, then remove everything to a bowl. In the meantime slice the cheese into small 1/2 inch cubes and place in an even layer in the warmed pan. Bake for about 10 minutes so the cheese can evenly melt. *Note: Rick has taken great consideration in identifying everything in the back of this book, down to which ingredients and sometimes specific brands, he recommends. I used an authentic Chihuahua cheese a local company makes, but otherwise he suggests Monteray Jack or mozzarella. Add the second tablespoon of oil to the skillet and add the chorizo, frying until done, about 10 minutes. Drain off excess fat. This was the first time both Johnny and I tried chorizo and it was delicious! Remove the hot cheese pan from the oven and drain excess fat if necessary. Spread the chile and onion mixture along with the chorizo over top. Place back in the oven for another couple minutes to heat everything. Scoop onto warmed tortillas (again I bought from a local company that makes them fresh and delivers to stores) of your choice. Johnny opted for corn and I went for flour. The sausage is surprisingly subtle, with complexity and a hint of heat. 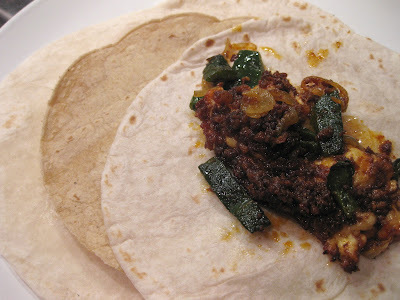 The poblanos, once roasted and their seeds removed, are not hot, but full of chile flavor. Since being slowly sauteed the onions have a sweetness that lends itself to the other bolder ingredients. Seriously, the next time you cook like this, you have to invite me over... speaking of, we should get together soon! I don't know what I'm more excited about...to learn that you are a Rick Bayless fan, that he talked to you on twitter, that you have a SIGNED cookbook, or how fabulous this dish looks! Hubby and I watched his show religiously and own a couple of his unsigned *sniff sniff* cookbooks. Hubby is the cook in this household and also Mexican so he's tried several of the recipes and they are always sublime. In fact, he's making a roasted pierna de puerca this Sunday and I can't freakin' wait to try it. Have you been to Frontera Grill or *sigh* Topolobampo? I have NOT and am dying to go. We have made 2 attempts to get to Frontera and both times something came up and we had to change plans. It's really inexcusable that we have such an amazing chef in Chicago who we adore and have not been to his restaurants! Ok, back to your Queso Fundido...seriously it look amazing. I was happy to read that you did NOT substitute the Chihuahua cheese AND that you used Poblano peppers (one of my favorite dishes of all time is chiles rellenos). Did you use white or yellow onions? I've always favored yellow but learned from one of Rick's shows that he prefers white in Mexican cooking and I notice a huge difference, even in my rice, when I use white vs. yellow. Chorizo & eggs (scrambled) with flower tortillas is one of the best and simplest and most delicious breakfasts in the world. Melted cheese? ooh la la Christina! And wow, Rick Bayless IS really a nice guy! I love it when celebrities (he's one to me!) are so real. We should, Mara! I keep hearing whispers of a 2nd blogger meet up. haha Cyndi you crack me up! I used a yellow onion, but now that you mentioned his preference I looked it up in the back of the book and you are correct! I thought you'd like that Sophia! And the edges of the cheese got crisp and yummy, it was delicious! OMG, what a great story! I love Rick Bayless too. My store is that I was at Frontera Grill around 1998? Anyway, it was just when habanero peppers were becoming popular, and as hard as I tried, I could never find them! I asked the server where the restaurant got them and he said "the grocery store?" I of course ate everything on my plate, but as we were leaving the server starts to hand me a bag and I start to say that there shouldn't be a doggie bag, but he handed me A WHOLE BAG of habaneros! That is when I found out how fricken hot they are - I took one big bite the first time and within seconds I was crying and sweating! Of course, I would leave out the onions in your recipe but it looks amazing! What fun! I love Rick Bayless even more now. OMG this looks so fantastic! I love crispy cheese seriously. I guess I need to buy chorizo and get it in gear. Yum. Oh my gosh Christina! This looks so good! It reminds me of a dish I had at Hat Dance in Chicago. It was seafood fundido. The melted cheese, with lobster and shrimp and onions, and you put it in a soft tortilla. My mouth is totally watering right now!